MH370 is in jungle? 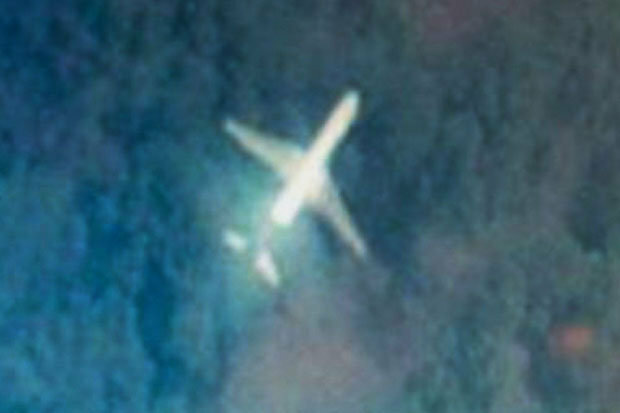 A BRITISH video producer has sensationally claimed to have discovered the remains of the doomed Malaysian Airlines flight MH370 on Google Maps. “Measuring the Google sighting you’re looking at around 69 metres, but there looks to be a gap between the tail and the back of the plane. Mr Wilson added: “I just thought I’d have a wander through. I work in digital video so I’m on Google Earth all the time. “So I was on there, a few hours here, a few hours there. If you added it up I spent hours searching for places a plane could have gone down. The last words from the cockpit to Malaysian air traffic controllers, “Good Night Malaysia Three Seven Zero”,were heard at 1.19am by either Captain Zahaire Ahmed Shah or his co-pilot. He said: “They know the transponder was turned off for that flight, it could have gone anywhere. “It’s assumed it turned south. But just north from there is Thailand, Cambodia and Vietnam. “The route fits as well. It got to just where Malaysia switches to Vietnamese airspace. I doubt that is the plane , if it came down in jungle that plane would be ripped apart . Sorry but that is not the Malaysian aircraft that this guy claims . do you go to BHS?